Before man invaded, a vast stretch along the southern coast of Africa, was once a lush green forest. A seagull’s view coming in from the sea would have seen the whitewash breakers of the Indian ocean spilling onto the pristine beaches, immediately bordered by thriving green indigenous forest, stretching far inland. Due to the high rainfall and moisture, water-loving-ferns, lofty trees rising up to 15 to 30 meters, including ironwood, stinkwood and yellowwood and fynbos plants flourished in this jungle. The Outeniqua yellowwood can grow up to 40 meters and reach an age of 1, 000 years. The forest was inhabited by small animals like lynx, genets, honey badger, blue antelope, porcupine and bush pig, and larger animals like bushbuck, eland and buffalo, all prey to the leopards who hunted freely. Birdlife, like the red billed woodhoopoe and the famous emerald green Knysna loerie struck up a forest melody, disturbed ever so often by the barks of baboons and squawks of monkeys, looping from tree to tree. 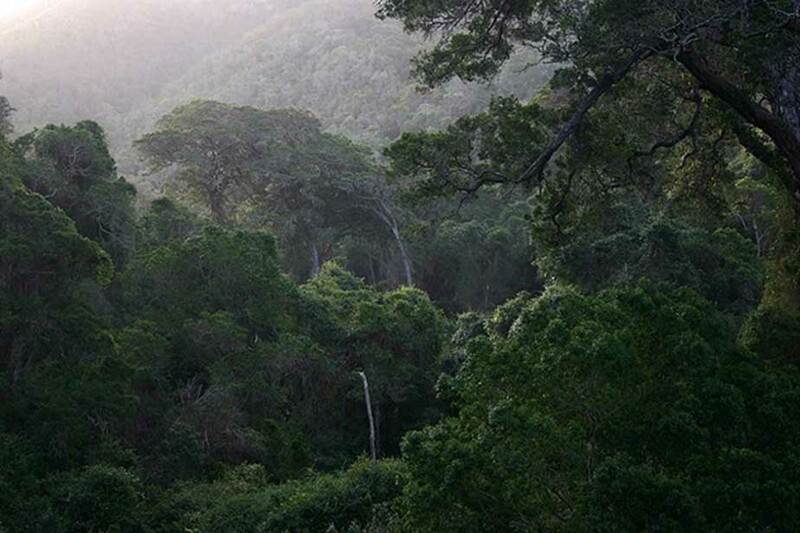 This mystical, magical forest was also home to great herds of Knysna elephants, who existed in peace in this green sanctuary for hundreds of years. Like phantoms, the elephants moved silently through the forest, the dense undergrowth absorbing the sound of their big feet and the canopy of leaves above obscuring direct sunlight to reveal their grey silhouettes. Scarcely visible among the green camouflage, they browsed fynbos plants, leaves of trees and ferns. The only clue of their presence would have been a tree crashing down as they leaned on or pushed it, or if one were close enough to hear the low frequency rumbling of their language as they spoke to one another, over long distances. Their habitat was once not just restricted to the forest, but also the swamps and neighbouring grasslands, but it was in the forest where they thrived. Elephants gestate for 22 months and females can give birth every three to four years and can continue to produce until the ripe age of 50 to 60 years. A herd is led by a female matriarch, males stay in the herd up to puberty and then join up with bachelor herds and will return to the herd as a mature bull only to breed. Elephants count among the most intelligent species on earth and are very adaptable. They communicate by rumbling noise, but also with a twitch of the tail, a flicker of the ears or a movement of the head. The only humans to share this paradise were the Khoikhoi and the San, who hunted with bow and arrow, but they made no great impact on the animal population. All changed by 1763, when the land was invaded by settlers; woodcutters, farmers and hunters. The settlements in the Cape colony required timber and the Knysna forest provided ample coveted stinkwood and yellowwood for floors, furniture and shipbuilding. The forest was systematically destroyed as timber was felled, transported by ox-drawn cart to the village of Knysna, from where it was shipped out. The tranquillity of paradise was forever lost to the racket of pumps, steam engines, construction work, dynamite blasts and a multitude of saws and axes, cracking the ancient trees down, one by one in their thousands. The fresh, damp moisture, natural forest scent was overrun by the reek of oil, tobacco, alcohol, human excrement and greed. The forest was raped and ruined. By 1846 all worked out forest land was sold to private owners and Crown forests were closed, but the peace did not last long. By 1856 the Crown forests were opened again, but under curatorship of a Conservator. The forest might have recovered had it not been for the event of gold being discovered at Millwood in 1860. Hundreds of fortune seekers, some from as far as the America’s, flocked to Knysna forest and within a few weeks the population increased to 1, 000 people, building shacks, hotels, shops, saloons and music halls. Six hundred miners delved the once gurgling streams in the forest. They sank deep shafts and had to install pumps to keep them dry. 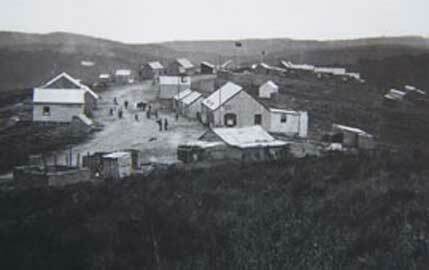 The lure of gold did not last and within about 20 years, Millwood town had become a deserted ghost town. It is reputed that the only ones to have profited from the gold, was the government, who issued licences to the value of £15 000. The delvers left to seek and find their fortunes on the Witwatersrand Gold Reef in the Transvaal. However, their presence in the forest, short as it may have been compared to the hundreds of years that the elephants had lived there, did not spare the elephants. Relentlessly the elephants were hunted by guns for their ivory. Elephants tend to stick to their own paths and soon the hunters would dig huge pits along these paths, where elephants would be trapped and shot. In 1867, His Royal Highness, the Duke of Edinburgh and his hunting party arrived at the docks of Knysna and soon set off for the forest. The Prince reported: “In an open glade, between belts of forest, 11 elephants were seen together … shot after shot were fired amongst them. Several were wounded, but most of the hits produced little effect. All the brutes managed to reach cover in the forest, through which they penetrated with loud trumpeting and crashing. Two of them, however, were so severely wounded, that their blood-spoor could be followed for a long distance.” Finally, the Prince and his entourage fired a volley of shots and killed a big male charging at them from 20 paces. By 1876, Captain Christopher Harrison, conservator of the forests, wrote to the Cape Government expressing his concern at the alarming rate that the elephants were being exterminated, but to no avail. Only by 1908, were they declared royal game. By 1870 of the herds of thousands, only 400 to 500 elephants were estimated to have remained in the forest. By 1914 there were 13 left, but the herd grew to 20 by 1920, when Major Pretorius was granted a licence to shoot one for ‘scientific reasons’. He shot seven. 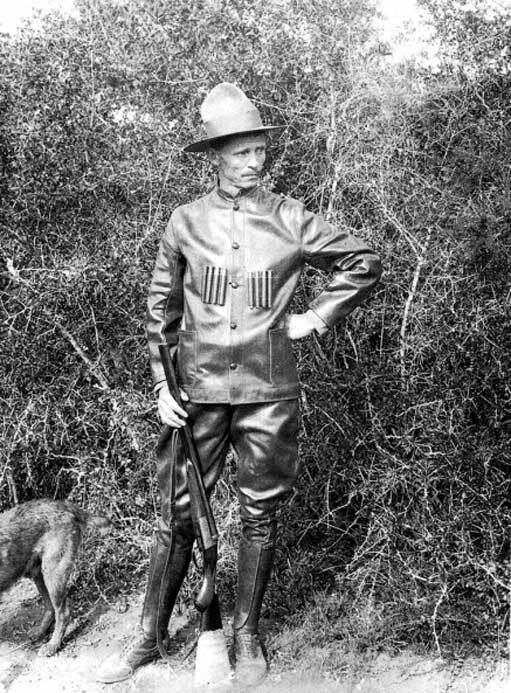 Miss Cuckoo Lister, part of Pretorius’ hunting party, gave the following account: “One cow charged them, so John fired at her and wounded her and then we saw the whole herd career down the slope and dash into the forest near Pretorius with the dogs after them and all the beaters and us yelling for all we were worth. Soon after, the great bull emerged, just below Pretorius, and he fired at it in the back so as to get a good cinema picture.” Major Pretorius was supposed to send the skeletons and ivory to the South African Museum in Cape Town. When the tusks finally arrived, they did not fit the skulls of the elephants. Ivory trade was still rife in the 1920s. Hidden among the timber on the wagons and ships, ivory was smuggled out. By 1939 the forests were closed to woodcutters, except for the removal of dead and dying trees. Their habitat destroyed, the remaining elephants did their best to avoid areas where they had been slaughtered. Previously they did not hesitate to roam near human settlements and their large numbers would often hinder ox-wagons and carts on the roads. They had adapted and they had learnt that humans kill. They retreated deeper and deeper into the verdant forest, their grey blending in, existing more within the shamanic dream state of imagination. Shrouded by mystery, the elephants vanished from the naked eye. Debris of the miners were scattered all over the forest, left to decay and rust. The most prominent landmark left of the Millwood town was the cemetery, inhabited only by ghosts, but life continued in Knysna, the port sheltered by a large lake, where the timber industry flourished. At the height, 12 ships were docked in the lagoon, importing mining machinery for Millwood and shipping out the timber and contraband ivory. By 1882, the three hamlets; Melville (to the west), Newhaven (to the east) and Eastford merged to form the Knysna Municipality. Prominent founder fathers were George Rex, the Duthies, Barringtons and Thesens – who operated a mill in the forest, before the gold was discovered. Knysna developed into a typical picturesque 19th century town. George Rex bequeathed land for the building of a church. The lynch gate of the church was solid teak, donated by the Thesen family, in memory of Miss Bessie Thesen, nee Harrison, daughter of Captain Christopher Harrison, who tried to conserve the elephants. The old cemetery is dotted with the graves of members of the Rex family, Captain Thomas Horn, first mayor of Knysna and the grave of John Benn, first man to pilot the ships through the treacherous Knysna Heads. Quaint Victorian styled buildings added a charming ambience to the town, which prospered due to the timber industry. Bustling Knysna was almost destroyed in 1869, when a farmer who had been burning scrub on his farm failed to contain the fire and soon a raging inferno threatened the district. The fire touched the forest belt, but did not penetrate the deep forest. By some miracle, the town of Knysna was saved, when the wind changed and turned the fire away, just as it was reaching its outskirts. Two fine estates, Portland and Westford were gutted. The fire of 1869 was an omen for worse to come about 150 years later. The town was threatened by the Anglo Boer War in 1901 and responded by mobilizing the Town Guard, arresting the minister of the Dutch Reformed Church and erecting the Knysna Fort, resembling an English castle on the hill. The war never reached Knysna. As the elephants disappeared into myth and legend, the town of Knysna prospered and expanded. In some sense the forest recovered, but in 1979, some part of the high forest was destroyed to build the Tsitsikamma toll road and the national freeway cuts right through the town, severing it in half, offering passage to thundering trucks and convoys of tourists alike. The town evolved into a popular tourist attraction and retirement haven for the rich and wealthy. Yachts cruise the lake and the Victorian buildings have been restored to their former charm. Old mills have been turned into shopping malls and restaurants. In June 2017 disaster struck as the fires from hell was unleashed and this time the town was not spared. Most of it burnt to the ground. After the fire, the town arose from the ashes and a nationwide relief effort was set in motion to assist. Garden Route National Parks manager, Paddy Gordon announced the indigenous Knysna forest did not burn down and the wild animals had not been affected by the fire. And the elephants? For years rumours abound that there was one remaining matriarch elephant somewhere in the forest. In 1987 and again in 1990 a mature cow and a young bull were observed and sometimes the lone matriarch was even photographed. For a while hope flared when it was surmised that there were two mature cows and a calf roaming the forest. In 1994 three young elephants were imported from the Kruger National Park in attempt to recreate a herd. By then foresters were convinced the population consisted of a mature cow, her calf, a young bull and possibly an old bull. Disappointingly, it was later established that only the matriarch had survived after all. Hope was pinned that the elderly matriarch would accept one of the new Kruger Park bulls as a partner. In in 2007, a population survey in the area found evidence of at least five females, along with possibly three bulls and two calves and in March 2016, a South African National Parks ranger, Siviwe Nondobo, on an evidence-gathering expedition, managed to videotape an old matriarch by chance. How sad that of the thousands of elephants that inhabited the indigenous forest on the southern tip of Africa, only one or at best a handful, have now retreated into the inaccessible areas where no man can venture. The Knysna elephants, once giants of the forests, have evaporated into the mist of myth. Hi Guillaume. Yes my father and I used to explore the forest, searching for elephants and he showed me the ruins and debris at Millwood. We spent many happy memories there. He died in Knysna and was spared the fire. Such a shame on humans. Yet another paradise lost. The forest is all but gone and is not readily accessible. If one drives on the main road one can easily bypass what is left, just a distant view. An accurate assesment by Micki.